No matter where you're traveling, it's smart to know what kind of bugs or animals to watch out for. Luckily, most insects in New Orleans are harmless, but they can be annoying for locals and visitors. Today, mosquitos in New Orleans are mainly an annoyance instead of a health threat. But historically, that hasn't always been the case. Between 1817 and 1905, more than 41,000 people in New Orleans died of yellow fever, which was carried by mosquitos. In 2017, the New Orleans Mosquito and Termite Control Board discovered the West Nile Virus in mosquitos. Mosquitos pass the virus to humans after biting an infected bird. However, there have been no reported human cases of the virus, or the mosquito-transmitted Zika virus either. Mosquitos need water to breed, but they don't need much. And despite all the mosquito control measures, these insects are still around in numbers large enough to make a summer night miserable. You can get bitten any time, but some species are especially active at dusk and dawn, and others in the hours around midnight. So make sure to pack or buy bug spray if you plan to be outside during these times. Termites eat wood and can be a major pain if they burrow into the foundation of your house. In New Orleans, subterranean termites are a big concern. These critters enter a building from the ground below, so there are often no obvious signs of their occupancy within. In addition to the regular subterranean type, there's also the Formosan termite, which came over on World War II ships. These massive bugs—10 times the size of normal termites—can build much larger colonies with up to 10 million bugs and eat an average of 1,000 pounds of wood a year, compared to the seven pounds that the native species eats. In 2000, the federal government financed a $15 million program to help control the Formosan termites that were destroying the historical landmarks in NOLA's French Quarter. One of the solutions was to add termite baits and traps, which look like silver and gold discs on the sidewalks. The roaches of New Orleans are bad enough when they scurry across the floor or crawl along the ceiling and walls. But when they fly, it's horrifying. 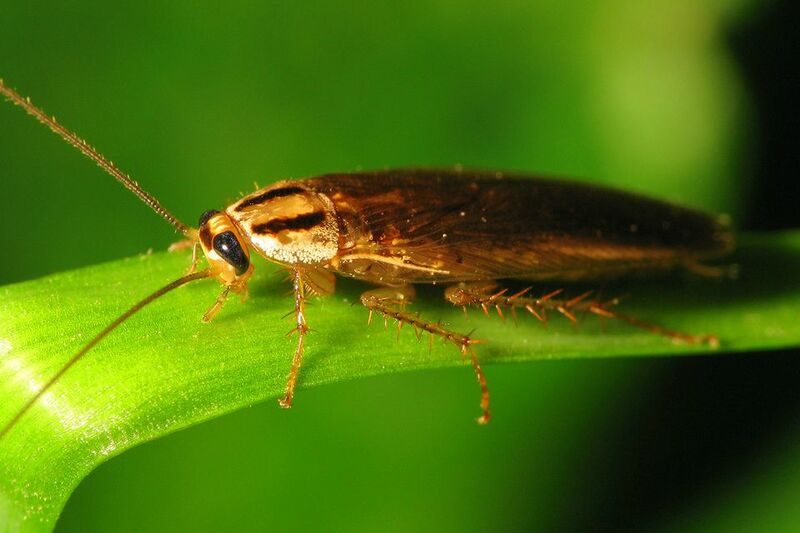 Roaches eat just about anything: food bits, glue off books, stamps, and even furniture. They love New Orleans due to the heat, moisture, and humidity, plus all the hiding places in old buildings. Most New Orleans specimens are German roaches or American roaches. They can squeeze through the smallest of spaces, so fix doors and windows gaps. And pick plastic over paper at the grocery store, or at least get those brown paper bags out of the house fast. That's a favorite mode of roach transportation. Usually, caterpillars aren't a cause for concern, but in New Orleans, there's a special stinging, spiny caterpillar that falls from the trees every spring. After their cocoon stage, the caterpillars turn into buck moths, which fly around during deer season. They are brown and black, with a white stripe on their wings and a fuzzy body. In spring, the eggs that were laid on oak trees hatch into the stinging caterpillars, which can be seen in prickly bunches on tree branches. They crawl down or drop from the branches and can often be found under every tree in a neighborhood or park. The spines on these fuzzy and prickly creatures are their defense mechanism. They release a poison that causes the painful sting when they prick your skin. Do not touch these caterpillars. If they sting you, use scotch tape to pull the spines out of your skin. Then soothe your skin with an ice pack or ointment. Is It Safe to Drink the Tap Water in New Orleans? Do You Need to Rent a Car When Visiting New Orleans?